MVNP’s internship program is the perfect opportunity to not only learn, but also gain genuine, industry specific experience. Internships take place all year long, typically consisting of current college undergrads or recent undergrad graduates, and each lasting for about 3 months. Roles and responsibilities can vary, but it’s common for an intern to take up a role in account service, PR, or creative/copywriting. So what makes our internship program unique? At MVNP, the interns aren’t just pushing papers all day and performing menial tasks (the typical intern horror story), but they’re actually assigned projects that their supervisors would be taking up as well. Most importantly though—and key for learning and growth—the interns don’t spend all of their time siloed into just performing their roles. Interns are given the opportunity to meet with each director (President, Executive Creator Director, Director of Account Services, Director of Public Relations, Media Director, etc. ), and learn exactly what the directors’ functions are within the agency. These department-specific meetings are always enlightening, as was the case for MVNP account coordinator, Janelle Ng. As an intern in the summer of 2016, she attended a presentation about cultivating new business—a sub-area of agency business that was not yet on her radar. Her newfound interest lead Janelle to her second internship at MVNP, and later earned her a position on the First Hawaiian Bank account team. Department-specific meetings foster a sense of the pursuit of learning, but also a sense of family and community. Everyone here is on a team, and as an intern, you learn to work within the larger agency as well as working in your specified team, whether it be account service, PR, or creative. Everyone wants to help you flourish and develop, which often leads to internal growth within the agency. Currently, seven of our MVNP members started out as interns, including Janelle and our Executive Creative Director, Vince Soliven. In addition to the real possibility of a full time job, there are many other and arguably more positive takeaways. Typically the internship is client facing, leading to heightened interpersonal skills. Additionally, whether internal or external, interns have the chance to present their work, which allows for personal presentation abilities to be tested as well as honed. MVNP offers a creative and encouraging environment where everyone is pushed to share their ideas. 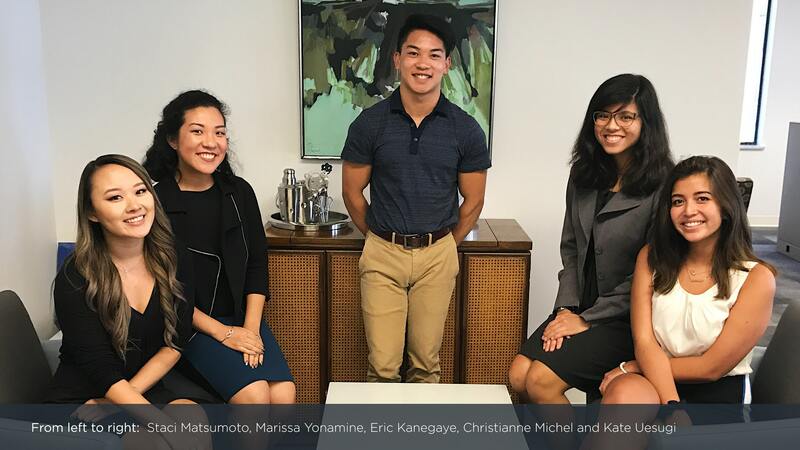 This gives interns a real chance to have their voices heard and even leave a lasting impact on the largest ad agency in Hawaii. Lastly, interning at MVNP allows you to really understand what it’s like working for a sizable Hawaii company, while at the same time enjoying real industry specific challenges and responsibilities. So whether you have a genuine interest in advertising/marketing or you aren’t sure yet, interning at MVNP allows for a real opportunity to gain important professional skills that will help launch any career. Of course, as with any internship, these benefits must be earned. In order to truly reap any yield, our Executive Creative Director, Vince Soliven challenges interns to “Make yourself needed. By the time you leave, you should be truly missed by both your supervisor and colleagues.” Have no fear though. If you intern with us, you will find yourself constantly stimulated and working seamlessly with the MVNP team, preparing and providing you with applicable skills and qualities for future internships, jobs and life. As for myself, I’ve had a brilliant experience interning at MVNP. I’m not a marketing major and actually plan on pursuing a career in commercial real estate, but have many great takeaways from my summer with MVNP in account services. In particular, I found attending meetings with clients to be enlightening. This is because I got to witness how my supervisors interacted with clients, and enjoyed the opportunity to interact with clients as well. Being able to compose yourself in front of a client is an invaluable skill. One of the clients that I interacted with was a law firm that dealt with Construction Law. I found the meetings with this client to be extremely pertinent to my interest in commercial real estate and just shows that even if you aren’t necessarily planning on pursuing advertising, there are avenues to explore your potential interests here at MVNP. I also enjoyed, as well as admired, the amount of genuine, agency related responsibilities that interns have here. The most important part about interning for me, is gaining valuable experience, but also feeling like the work I’m doing is actually making an impact within the company. MVNP has checked off all of these boxes and more. I would 100% recommend interning at MVNP, especially so if you have aspirations in advertising and marketing. Interested in an internship? Contact us here. Author/Intern Eric Kanegaye attends George Washington University, Class of ‘19, and is pursuing a career in real estate development. He’s also watched 20% of the IMDB and Rotten Tomatoes movies so far—which makes us think Eric might be developing movie theaters in the future.